Some vintage NASCAR stock cars are interesting because of the driver, the owner, or its history, but this 1986 Chevrolet Monte Carlo Aerocoupe is the rare triple threat. Even without a pedigree that will instantly turn your garage into a trophy room, this car will get you some pretty long glances on the vintage NASCAR race circuits. If you're a NASCAR fan, then you know this paint scheme. This is the Budweiser car from Junior Johnson's race team. This exact chassis was piloted by driving legend Neil Bonnett in several races from 1984-1986. You also know this design well because it's the teammate to Darrell Waltrip's #11. In fact, Waltrip was coming off his championship season in 1986, and this was his final year with the team. 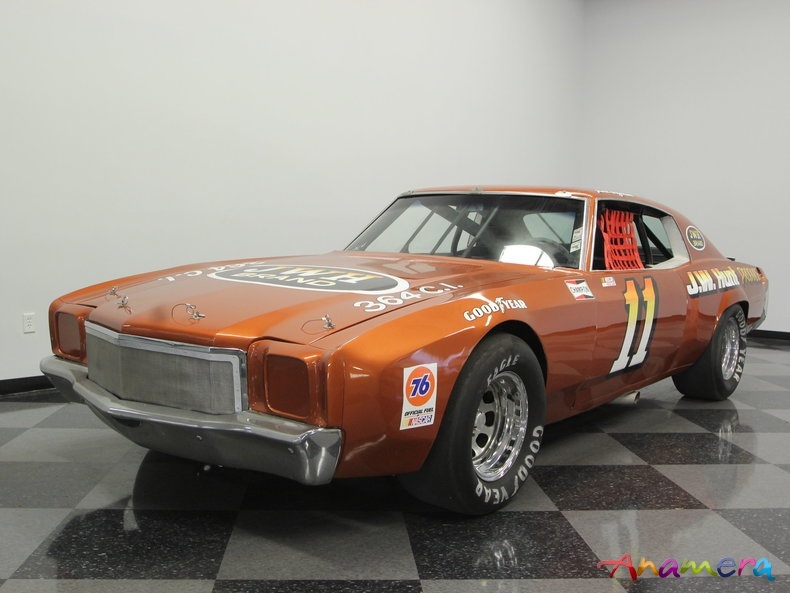 The design of this Monte Carlo Aerocoupe is one of the last great NASCAR factory custom racers. Chevrolet produced the Aerocoupe specifically to go faster on the track. They rectified the brick-like design of the Monte Carlo with lower front chin and bubble back to give these GM cars a new wind-cheating advantage. This is the same outlaw attitude that created the legendary cars like the Dodge Charger Daytona and Ford Torino Talladega. This is now your opportunity to be far more rare than those who bought one of the handfuls of production cars that were made to sneak the racecars on the track. Instead, you get to own the actual racecar. This one is ready to go vintage racing with the D&M racing seat, RCI harness, plastic windows, driver's net, and quick release steering wheel. This one even has the Delco HD ignition box and electric kill switch. There is no center console; just the fire extinguisher and multi-point roll cage. This is a pure race machine, and you know it because the tach is your largest instrument and the Hurst shifter is your brightest piece of chrome. Under the hood is a true competition motor that runs on race gas. It starts with a 350 cubic-inch V8 with a bored 0.30 kit, huge headers, and an earth shattering side exhaust. There is some serious grunt coming out of this thumpin' motor, and so it's reinforced under a full crash cage, aluminum HD radiator, steel braided lines. Not only is it powerful, but you also have the reliability of a chassis built by the legendary NASCAR builder Banjo Matthews. This full race package is backed up by a five-speed manual transmission, and you even get four-wheel disc brakes. And just in case you were thinking about trying to hang a license plate on this one, remember that law enforcement can hear you from a county away. Instead, this is the perfect car for you to take to the track events where you can have a blast on the laps and be admired in the pits. You're looking at the kind of car that was often used up and thrown away. This is your rare opportunity to get one of the few that was rescued and restored. We are now only beginning to appreciate these track cars for their significance. So if you recognize the importance, and are quick enough, this is one of the most interesting vintage racers you can take to the track day.